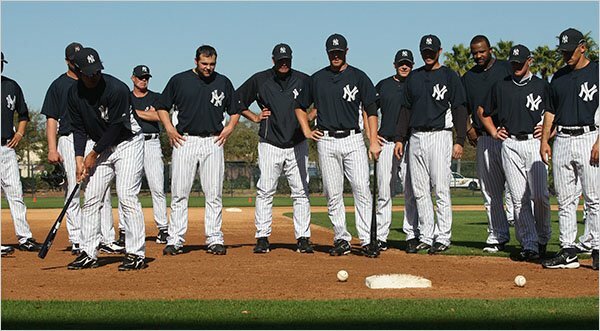 From NYTimes.com: TAMPA, Fla. — From the two diamonds just outside Steinbrenner Field came the sounds of loud laughter, sporadic shouting, clapping hands and the occasional howl of anguish — not the normal noise associated with the pitchers’ fielding practice. Instead, the mild uproar stemmed from a hybrid game of golf and baseball being played by about two dozen Yankees pitchers and their coaches, and Manager Joe Girardi. The game, actually an impromptu tournament, was the idea of pitcher A. J. Burnett. He casually mentioned it to Girardi, who quickly seized on it as part of his attempt this spring to revise his image. First the skipping practice to have a pool tournament, now this. This sounds like the time when the Yankees conditioning coach decided that running shouldn’t be a part of their conditioning regimen. That turned out well. Why practice baseball to play baseball? Even living in New York, I don’t understand what goes on in the Yankee’s heads. Girardi has said that the two activities are meant to improve bonding within the team. After this spring training, the Yankees should be so bonded with each other, I wouldn’t be shocked to see a few of them swapping Dubble Bubble mid-game. Bonding aside, I don’t see how this is going to help them get better, though not that I want them to. But seeing as how their pitcher-of-the-future, Joba Chamberlain went, ohhhh, 1 inning, walked four, gave up a hit, threw a wild pitch, left the bases loaded and recorded no outs last Friday, they might want to try working on a few pitching drills or something. But, you know what, putting with a baseball bat is probably a better way to fix all that. The only thing I can take away from this is that the Yankees are so confident in their off-season signings that they don’t even need to put in any effort to get ready for the upcoming season. I can only hope that this blows up in their faces. Along with the Dubble Bubble. You are currently browsing the archives for the dubble bubble category.